It’s quite fitting that Tom Egerton’s visit to KL involved him teaming up with Chocolate Concierge and Bar Trigona – the former well-known for their single origin artisan chocolates, and the latter for championing locally sourced ingredients. His masterclass on sustainability in the bar industry shed some light on the importance of sourcing as close to home as possible. The spirits evangelist from Proof & Company is a strong advocate for this movement, and is passionately involved in it from his base in Hong Kong. “I’m sure we’ve all gone through the ‘no straw’ campaign, which has been great, but the question of what exactly sustainability looks like in hospitality, what exactly that entails, is something we’re still working out as an industry,” he says to open the masterclass. To prepare for his guest shift, Egerton and his team (comprising of people from Wholly Spirits and Bar Trigona) went on a three-hour drive to Pahang to the farms of Chocolate Concierge to forage indigenous fruits and herbs to use as ingredients for his drinks. The fruits of their labour (pardon the pun) resulted in cocktails like Rambutan Orchard (made with cacao, rambutan, Mancino Rosso Vermouth, pandan, coconut foam, and green ant salt), Coffee Cacao (made with raw cacao, cold brew coffee kombucha, Mancino Rosso Vermouth, and tonic water), and Duku Langsat (made with duku langsat fruit, passion fruit ratafia, Mancino Secco Vermouth, sherry, and clarified dairy) – a small selection of distinctly Malaysian flavours. 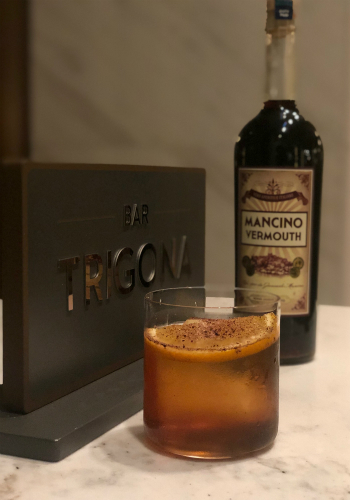 The Coffee Cacao cocktail from Egerton's guest shift at Bar Trigona, made from ingredients sourced locally. Being able to source ingredients so close by is beneficial in many ways: you develop a better understanding of the seasonality of the ingredients you work with, you support local farmers cultivating local produce, and you significantly reduce your carbon footprint. This factors into what is called the green cycle – along with other considerations like does organic waste get sent to landfill, is it composted, or is there a further step to take to maximise their use. As we see more bars operating on this philosophy – places like Scout in London, This Must Be The End in Sydney, and our neighbouring Native in Singapore – we could potentially start seeing more changes in behaviour from consumers and suppliers. “The understanding of ingredients gives you a better grasp of what your impact on the environment is, and how your choices as consumers, bartenders and operators, can have real effects,” says Egerton. “It’s just one small change of operation and understanding by a huge amount of people that can have that huge knock on effect.” In the past Egerton has done just that with Potato Head in Indonesia, using traditional Indonesian ingredients on their menu, and by extension creating a market with a strong local demand for it. This rather modern situation of having all produce available at all times of the year is something that has only developed over the last 40 to 50 years, part of a farming model that leaves an enormous environmental impact and a dangerous reliance on convenience. For example, seasonal fruits like citrus shouldn’t be available year-round, and as he elaborates “It’s not natural having that citrus always available, and it creates a huge carbon footprint. We currently rely on a farming model that delivers this, but reliance puts us in position where, if it were ever to collapse, we would lose the ability to make drinks. So suddenly if we can’t get that citrus, how are we going to be able to create that guest experience? It’s very hard to explain to a guest ‘well, unfortunately there’s a crisis at the Suez Canal so you can’t have a Mojito’.” Some alternatives he suggests are calamansi and even duku langsat – the latter making an appearance on his guest shift menu – that could get around this problem as a tropical country. Another thing to consider is the blue cycle – recyclables that pass through the venue, like glass bottles and plastics. A change in customer behaviour over the last few years managed to phase out plastic straws in bars and restaurants for the most part, and some operators now are taking further steps to reduce their own reliance on plastic packaging – Egerton says he recommends people to purchase three or four plastic PET tubs marked with the name of their outlet, and to organise a system with their suppliers to use these tubs instead of dealing with the inevitable mountains of polystyrene and plastic. “You’ll be surprised how very quickly businesses change their tune,” he says.